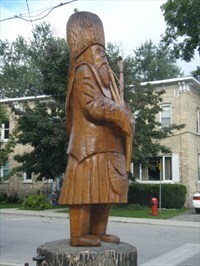 This carved Scottish Piper sits at the southwest corner of Wellington and Fergus Street, one block east of Main Street, in Mount Forest, Ontario. 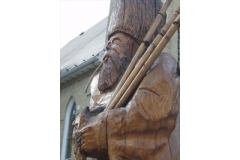 It stands about 10' tall perched on the stump of the tree that he was carved from. This piper is depicted playing his set of bagpipes. Fully adorned in his Scottish attire, he stands tall and erect. 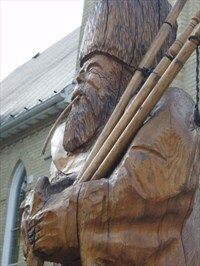 The chainsaw artist is Pete Mogensen who used a combination of tools to create it. 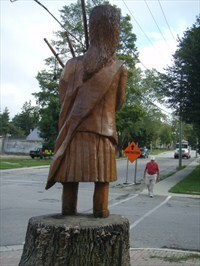 This carving is one of two displayed in Mount Forest.